Salt Tapas & Bar is located in the Civic Distric within Raffles City Shopping Centre and opposite the heritage Raffles Hotel Singapore. 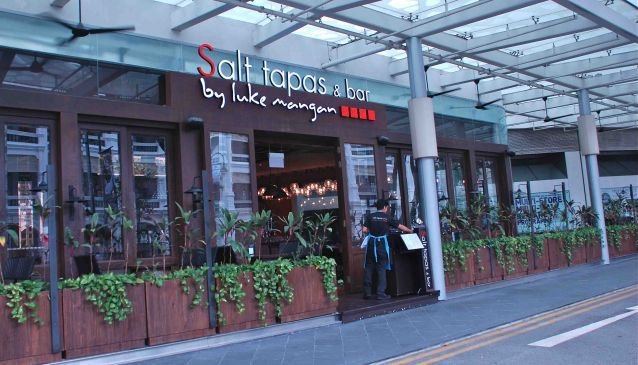 After the fine dining establishment Salt grill & Sky bar on Ion on Orchard , Salt Tapas & Bar is Celebrity Chef Luke Mangan's second restaurant in Singapore. Salt Tapas & Bar offers a more casual concept where friends and executives can share plates of succulent and flavoursome Modern Australian style tapas. Whether in the main dining area, the bar, the window or alfresco, enjoy a trendy yet relaxing setting to meet and mingle around some tantalising tapas of cosmopolitan flavours: Aussie Oysters, Spanish Ortiz anchovies, North African Tagine of snapper and octopus, Wagyu sausage, not to mention the international selection of wines. At Salt and Tapas Bar, surprise and satiate your taste buds with the most creative tapas while enjoying an impeccable service in a casual chic atmosphere.